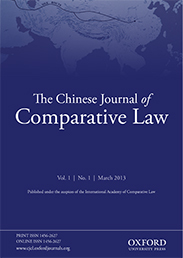 The Chinese Journal of Comparative Law aims to provide a leading international forum for comparative studies on all disciplines of law, including cross-disciplinary legal studies. It gives preference to articles addressing issues of fundamental and lasting importance in the field of comparative law and is particularly interested in publishing works having close relevance to the development of the Chinese legal system and the wider developing world. In September 2013, during a visit to Central and Southeast Asia, Chinese President Xi Jinping first proposed the initiative of jointly building the Silk Road Economic Belt and the 21st century Maritime Silk Road. Consequently, the Collaborative Innovation Centre of Silk Road Economic Belt Studies has been established in Xi’an, China, which was the eastern starting point of the ancient road. What was the rationale behind the joint construction of the Silk Road Economic Belt and the 21st Century Maritime Silk Road (or the ‘Belt and Road’)? The ancient Silk Roads on land and sea contributed significantly to the prosperity and development of countries in Asia, Europe, and Africa for thousands of years. The “Silk Road Spirit”, which promotes peace and cooperation, openness and inclusiveness, mutual learning and mutual benefit, remains a cultural heritage shared by all countries around the world. Against the background of the weak recovery of the global economy from the downturn, the initiative was proposed with the intention of promoting economic cooperation among countries by enhancing the orderly free-flow of economic factors and the efficient allocation of resources. The ‘Belt and Road’ run through the continents of Asia, Europe, and Africa, connecting the vibrant East Asia economic circle at one end and developed European economies at the other, and encompassing many countries with huge potential for economic development. It is also an effort to explore new models of international cooperation and global governance, which will make positive contributions to world peace and development. Which countries are included in the initiative and why? The initiative covers and focuses on, but is not limited to, the area of the ancient Silk Road. It is open to all countries, and international and regional organizations for engagement, so that the results of the concerted efforts will benefit wider areas. It is therefore inclusive rather than exclusive of any countries that are interested. More specifically, the Belt focuses on bringing together China, Central Asia, Russia, and Europe; linking China with the Persian Gulf and the Mediterranean Sea through Central Asia and West Asia; and connecting China with Southeast and South Asia, as well as the Indian Ocean. The route is designed to go from China’s coast to Europe through the South China Sea and the Indian Ocean in one route, and from China’s coast through the South China Sea to the South Pacific in the other. How will potential legal disputes arising from transactions facilitated by the ‘Belt and Road’ be resolved? The ‘Belt and Road’ is not intended to replace existing frameworks of international cooperation. Existing international dispute resolution mechanisms such as commercial and investment treaty arbitration, and the WTO dispute settlement system, will continue to play significant roles. However, new mechanisms and facilities of dispute resolution may be created, and in particular the creation of relevant new platforms at bilateral, regional, or multilateral levels. For example, it has been proposed that a new arbitration centre should be established at Xi’an to help resolve commercial and investment treaty disputes arising out of transactions relevant to the initiative. What do you see as the current role and long term vision of the Silk Road Academic Belt? The concept of Silk Road Academic Belt (SRAB) was first used in the inaugural conference commemorating the launch of the Collaborative Innovation Centre for Silk Road Economic Belt Studies (CIC-SREBS, a joint initiative of the Ministry of Commerce, Shaanxi Provincial Government and Xi’an Jiaotong University) in January 2015 at Xi’an. It was then used in the context of the launch of the Universities Alliance of the Silk Road (UASR) by Xi’an Jiaotong University with universities along and beyond the ancient Silk Road. Collectively the SRAB refers to an endeavour by Xi’an Jiaotong University and other academic institutions to develop a new model of international educational and research cooperation embracing the ‘Silk Road Spirit’. The UASR and the CIC-SREBs are the two main platforms of the SRAB. Under the UASR, there are some subject-based alliances including the Silk Road Law School Alliance, launched in November 2015 by 21 leading law schools from China and abroad. The UASR and the CIC-SREBs have become leading platforms of international education and research cooperation that support the ‘Belt and Road’ initiative. In the long run, their aim is to become a top university alliance as well as an influential think-tank in the world. Where does the balance of power lie within the ‘Belt and Road’? The ‘Belt and Road’ is a joint initiative that embraces the trend towards a multipolar world, economic globalization, and cultural diversity. It will not only promote the development of international economy, but also provide a platform for further globalization. The initiative aims to promote the connectivity of Asian, European, and African continents and their adjacent seas, set up multi-tiered and composite connectivity networks, and realize diversified, independent, and sustainable development in these countries. In short, it is intended to be based on a new logic of shared interests and common development, rather than on the conventional logic of balance of power. How does this initiative compare to similar ones around the globe? The initiative cannot be easily compared to any existing or past plans or initiatives. Unlike the Marshall Plan, it does not exclude any countries, nor is it intended to serve any purposes of international power struggle. Rather it intends to explore a new model of international cooperation and global governance on the basis of the ‘Silk Road Spirit’, i.e., the spirit of peace and cooperation, openness and inclusiveness, mutual learning and mutual benefits. What potential impact will this have for those outside the Silk Road? As explained, the initiative does not exclude any countries, however, some countries might still choose not to join. It is expected that countries joining the initiative will substantially benefit from it. This has been demonstrated already by the establishment of the Asian Infrastructure Investment Bank and the Silk Road Fund. To a lesser degree countries staying outside of the initiative may also benefit from its spillover effects. Of course ultimately the degree of impact on insider or outsider countries will depend on the degree of success of the initiative. Featured image credit: ‘Silk Route’ by NASA/Goddard Space Flight Center. Public Domain via Wikimedia Commons. Wenhua Shan is the Yangtze River Chair Professor of International Economic Law and the founding Dean of the School of Law at Xi'an Jiaotong University, PR China. He is also the founding Director of the XJTU Silk Road Institute for International and Comparative Law (SRIICL), the Convenor of the Collaborative Innovation Centre for Silk Road Economic Belt Studies, and a Senior Fellow of the Lauterpacht Centre for International Law at the University of Cambridge. Wen is also the Editor-in-Chief of The Chinese Journal of Comparative Law, published by Oxford University Press, and was a co-author of the recent article entitled 'Introduction to the High-Level International Forum of the ‘Silk Road Academic Belt’'. Great to read your interview of Prof Shan. When we talk about a Chinese we normally use the two Chinese characters of his/her first name unless there is only one character. So I would either use Prof Shan or “Wenhua”, rather than”Wen” . Hope it helps. Regards, Pengzhu.